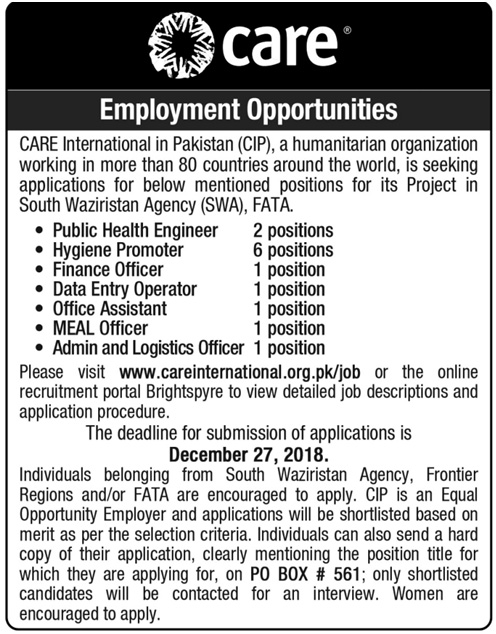 Jobs Description: Care International Pakistan Jobs December 2018 are listed below in our site. Care International in Pakistan (CIP), a humanitarian organization working in more than 80 countries around the world. Care International Pakistan has required the applications for following jobs. How To Apply: Individuals belonging from South Waziristan Agency, Frontier Regions and/or FATA are encouraged to apply. CIP is an Equal Opportunity Employer and applications will be shortlisted based on merit as per the selection criteria. Individuals can also send a hard copy of their application, clearly mentioning the position title for which they are applying for, on PO BOX # 561; only shortlisted candidates will be contacted for an interview. Women are encouraged to apply.